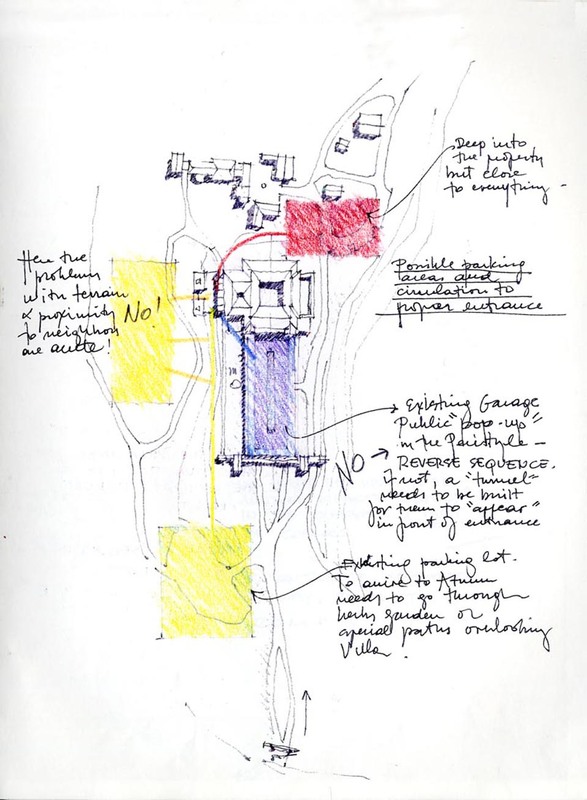 Part 1 of The Getty Villa: Beginnings is based on a lecture by Jorge Silvetti recounting the competition phase of the project and the concept that emerged during the design process. 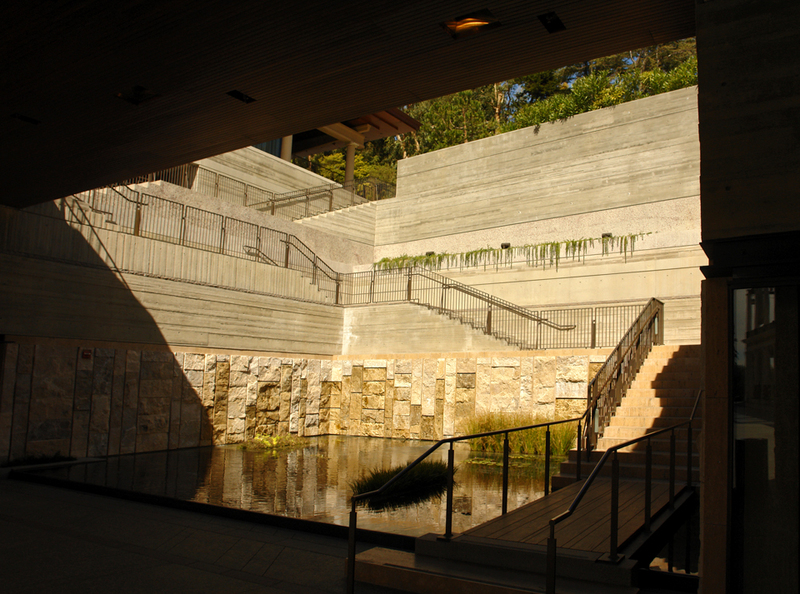 he Getty Trust consolidated all its entities and activities when it moved to the New Getty Center in December of 1997. The move, long in its coming, was preceded by years of programming and designing. 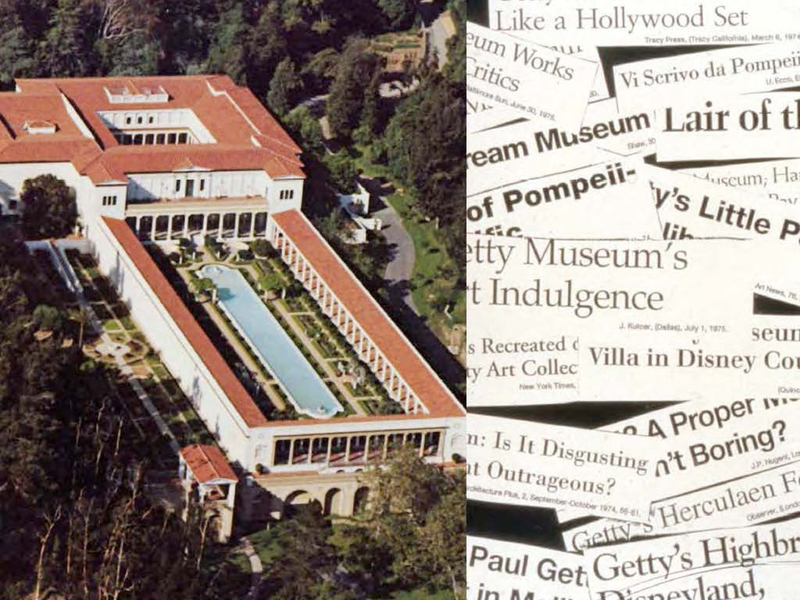 Well along in the process, The Getty began to think about The Getty Villa in Malibu and what its function would be, since it could not abandon it. In 1993, after a long international search for a design firm that could undertake the master planning of the site, and with a wonderful yet vague mandate, our firm was chosen together with five others to participate in, at that time, a most unusual final selection process. Instead of a competition, The Getty asked these six teams to work for two weeks recording their thoughts, reactions and ideas, triggered by a briefing and a day-long site visit. Correct the entrance to the museum. Open up the site to the public. Include other entities of The Getty. 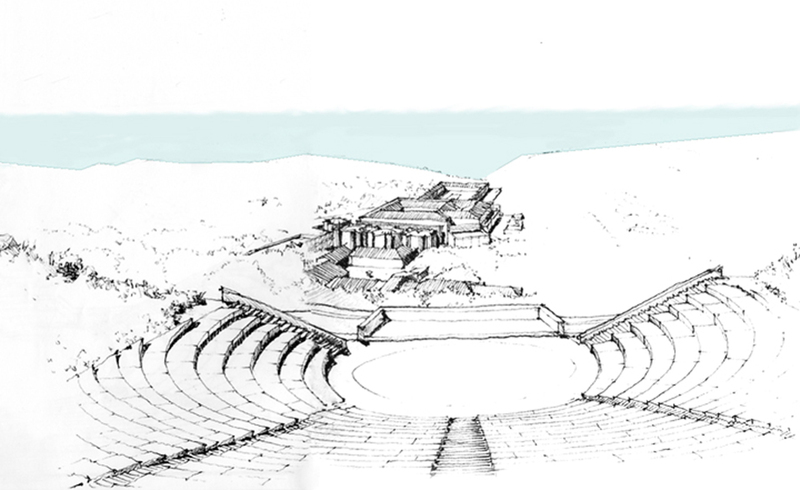 Include an outdoor classical theater. Although we could do whatever we wanted to address this brief, the requirement was that it be registered in a sketch book, 14" x 17", which was provided to each of the participants. The search committee traveled to the architects' offices, and spent a day with them talking about the book itself, the architects' work, their offices, and visiting their built work in the area. We were chosen after this round, and it may be worth now to comment a bit on our approach to the sketchbook. 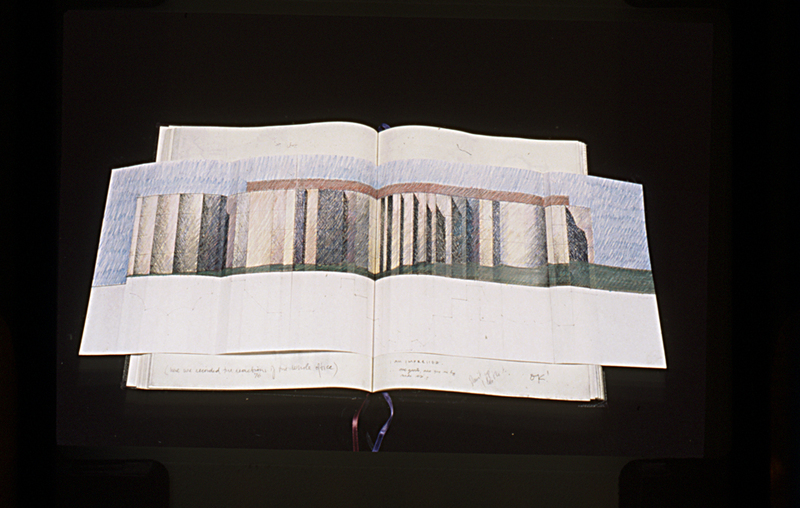 We took The Getty at its word and did not produce "A Project" for the Getty Villa but, mostly, architectural vignettes of things that we associated with what we had seen, heard, and what we understood as the aspirations. We produced sketches that stressed the character of any new intervention, and quite simply vignettes of things we liked. We wrote our thoughts as they came to our minds. Early on, it was decided to keep all the existing major buildings—we had to reuse them and open them to the public, and we needed to add new construction to replace obsolete ones and accommodate new programs. The Villa was to be a mini Center, as most of the entities would be placed in the new Getty Center. 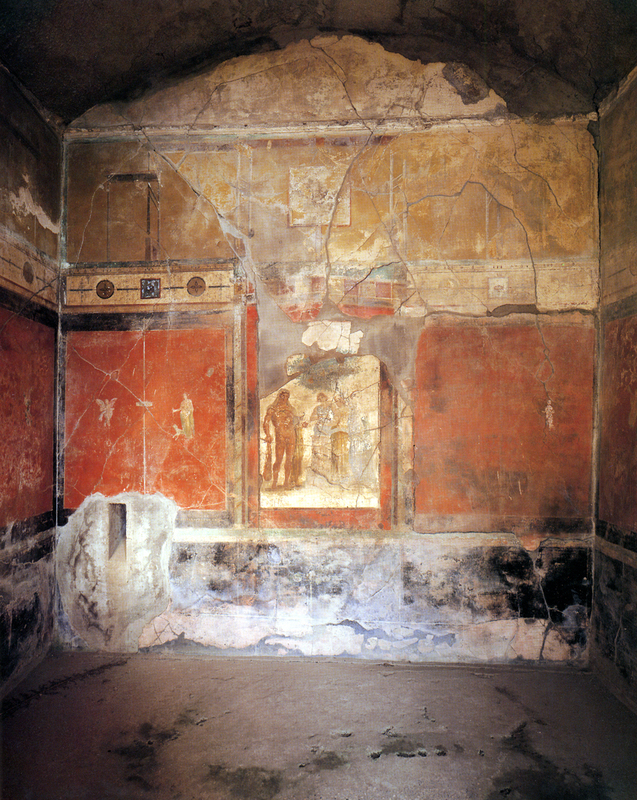 This building is a replica of a 2000 year old Roman villa that once overlooked the Bay of Naples near Pompeii. Started in 1972, the villa came into the world surrounded by controversy at the time of its opening. 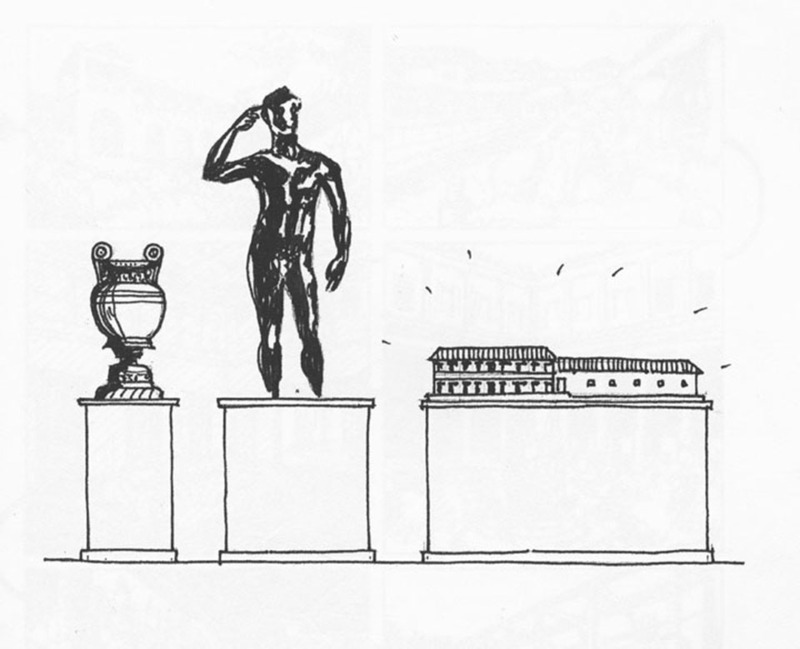 While the idea of a replica is not a purely architectural issue, the very history of museums and of art provided us with certain arguments and rationales for understanding and intervening in the Villa. Replication is at the very heart of western art. M. Pio Clementino established a cannon of western art based on Roman marble replicas of greek statues, which were in turn replicated all over Europe. The Academies of Europe established casting factories—a slow transformation and interpretation from cast to imitation to "original." 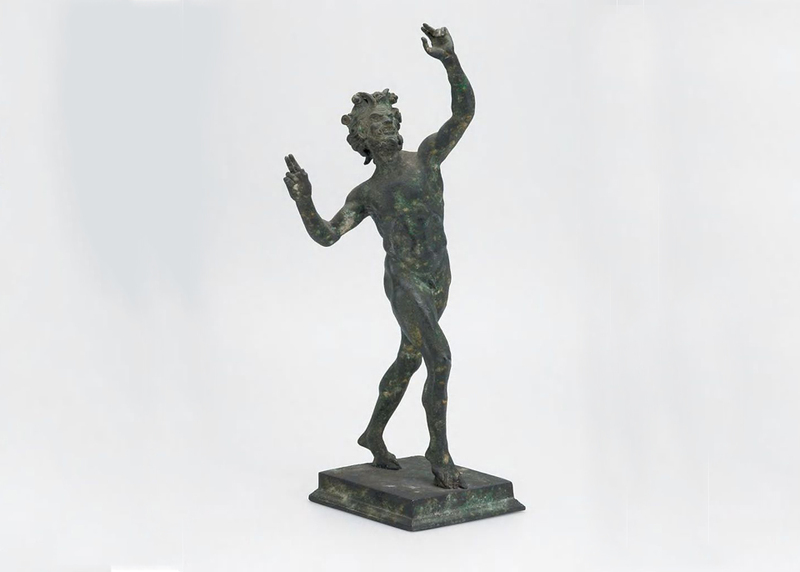 [Dancing Faun]... is argued by some to be based off a Greek original, with the dates assigned to that copy or to the Greek original ranging from 300 to 100BCE. Displayed for the first time in public in 1860, permits for taking molds from antiquities in order to copy them were soon granted to various individuals and institutions. The reprocuctions that these enterprises offered were often reduced in scale, making them easy for Grand Tourists to take home to northner Europe, Britain, or America. Surely a souvenir of the Grand Tour. This process of researching freed us of dubious moralisms about the nature of the museum building and that it greatly helped us to make some decisions that firmly established our design strategy. After all, the owner, ideator and funder had said: "...Why not show Californians what an especially attractive Roman building would have looked like, with its gardens, fountains, even details such as the lamps and appropriate flowers? Many contemporary museum buildings have failed while attempting less than that." We decided to approach the master planing and the design of the New Getty Villa by acknowledging that it will be made up by a heterogeneous group of buildings. No attempt will be made to give "unity" in architectural stylistic terms and perhaps more importantly in the current architectural climate to avoid the simplistic "aggressive", "violent" approach to existing buildings intervening with so called "critical" interventions. Our approach was to work as much as possible to maintain the architectural integrity of each piece, to make it better, and to produce a new architecture of strong identity, but which was also in the spirit of the place. Images of descent, excavation, multiplicity of ground planes, exploration and discovery began to mix and fuze with the project, and the sense that the Villa could actually be put in "quotation marks" as it were, became a prominent concept of the design. Our intervention became an infrastructural framework for framing the architecture of the Villa as part of the collection. Part II (coming soon) describes the material palette employed to achieve this sense of archaeological dig, putting the villa in "quotation marks". 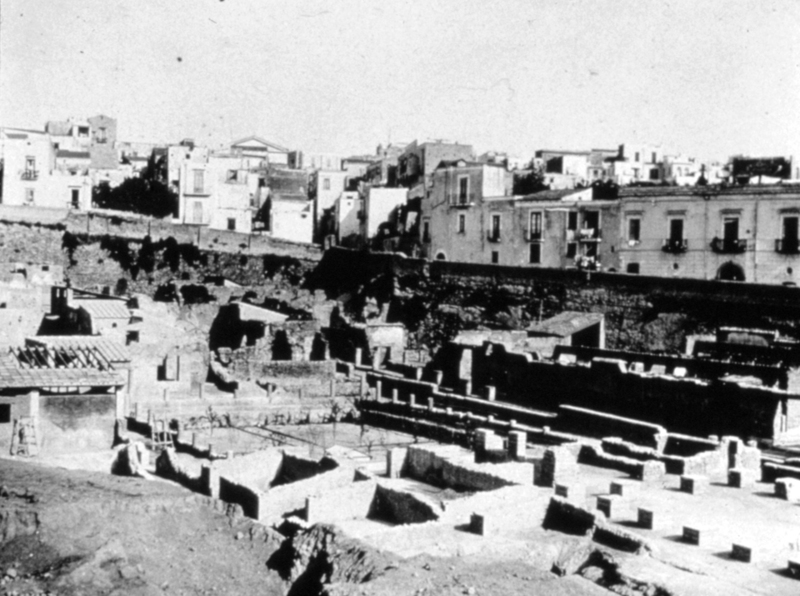 See the links below to explore more about the Getty Villa and the Project's related content.